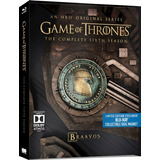 Blu-ray Game Of Thrones - 3ª Temp. (5 Discos) - Digipack Lc. Box Blu-ray Steelbook Game Of Thrones 5ª Temporada Novo!